Women in remote villages of Nagpur district are joining the digital revolution unfolding there. On a visit to Kelwad and Ghorad villages in the district earlier this week, I met women (and men) doing all kinds of financial transactions digitally- making electricity bill payments, recharging their pre-paid mobiles, depositing or withdrawing money from their bank account and sending money electronically. In one case, I learnt about the story of a pregnant woman who had to be hospitalized in the middle of the night. A digital funds transfer from her mother from the village directly to her which got immediately credited to her saved the day and help her get timely care. Anyone familiar with the rural landscape of India would immediately notice that something quite extraordinary is happening out there. Who is driving this quiet revolution in the villages of Nagpur district? Meet Paramita Sudhakar Gajbhaiye, a gritty and determined woman, working as a Grameen Mittra. Paramita is a single mother. She was determined to do something in life to ensure that her son got a good education. 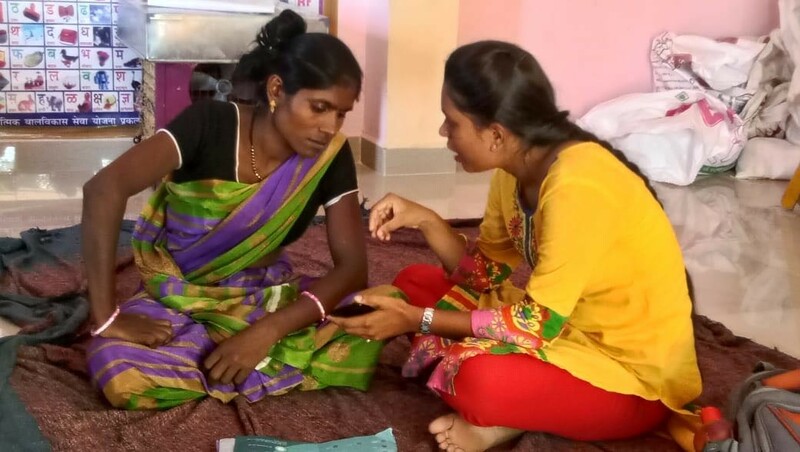 When she came across the opportunity to become a Grameen Mittra under Grameen Foundation’s Digital Inclusion via Education (DIVE) project, she just lapped up the opportunity. The project supported by CSR contribution from Citigroup Global Markets, and implemented in technical collaboration with the National Payments Corporation of India was recruiting 100 women in the district to become a Grameen Mittra (Friend of Villagers). After getting trained, Paramita received a biometric device which connects to her mobile phone and enables her to conduct digital transactions. Working with Spice Digital, a Business Correspondent for RBL Bank, Paramita now offer entire range of digital payment services on the door steps of customers in her village. With no bank or ATM being present in the village, people can now deposit or withdraw money, send a payment, pay their electricity bills from the comfort of their home. They not only save Rs 20 that they would have spent on the bus fare to travel to the nearest bank branch, they also save three hours of travel time. By doing their financial transactions without relying on their husbands, women are regaining control of their financial lives. Another service that Paramita offers is to apply for various e-governance services and entitlements from the government. A partnership with Haqdarshak enables Paramita to facilitate access to various government services at the doorsteps of people. For older men and women, it is nothing less than a boon that they can now for and receive their old age pension without going anywhere. In the neighboring village Kelwad, another Grameen Mittra Sindhu Sachin Suryawanshi is transforming the way people carry out banking transactions in her village. In this rather large village, which also has a bank branch, a large number of women and men now come to Sindhu to conduct their banking transactions digitally instead of going to the bank, which is always crowded. The idea of spending half of their productive day just to make a bank transaction does not excite anyone. Yet, this is what they had to do all these years, till Sindhu started offering these services way more conveniently. But all this didn’t happen overnight. Initially, people didn’t really trust Sindhu or other Grameen Mittras. But as they started seeing the benefits, more and more people, especially women, who have to constantly juggle between many priorities at home, are coming forward to use their services. But what makes Grameen Mittras such as Sindhu or Paramita successful? More than anything, it is their grit and determination to do something, even fighting against all odds.The stark contrast that some of the most disadvantaged women from these Nagpur villages bringing the latest digital technologies to men and women, young and old people in the village is unmistakably noticeable. Even though being a “Grameen Mittra” does not get them a fixed monthly remuneration, they value the opportunity to become self-employed and change their lives. Support of her husband was another critical factor in Sindhu’s ability to pursue this work. Her husband Sachin did not shy away from taking care of their daughter when Sindhu became a Grameen Mittra and had to devote long hours to this work. Within two months, Sindhu is now processing over 600 digital transactions in a month, earning Rs. 2,500 per month. In a couple of months, she expects to start earning Rs 5,000, a critical threshold to help her meet her needs and become an equal contributor in her household finance.